The Port North Estate is made up of Port of Brisbane Pty Ltd (PBPL) land holdings located north of the Brisbane River, including the bulk precincts of Bulwer Island and Pinkenba. The key activities in this area include warehousing, bulk and break-bulk storage, assembly operations and manufacturing. 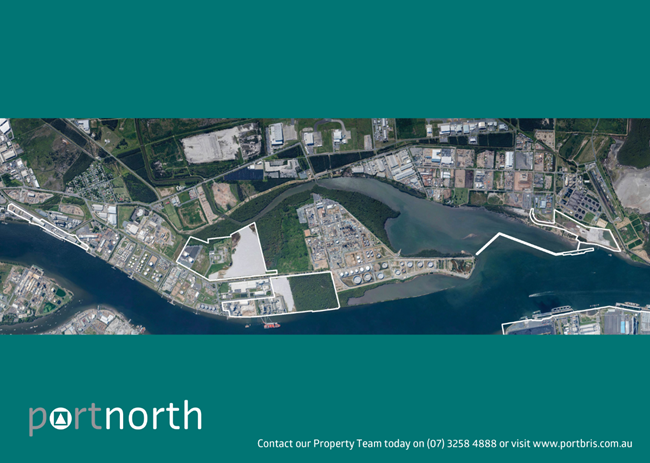 Port North comprises 69 hectares of land, including 14 hectares of wet land fronting the river, most of which is privately owned and operated. The PBPL - owned ‘common-user’ wharf (also called the Pinkenba bulk wharf) is used for cereals, silica sand, general cargo, wet bulk and fertiliser. In the broader context of the Port of Brisbane, and in line with the Brisbane Port Land Use Plan, Port North is classified as ‘Special Industry’ with the intention that available land will be allocated to wet bulk trade, general industry, or distribution centres. PBPL has formed a project team to prepare a development plan for this precinct with consideration for land parcels available now and in the future.